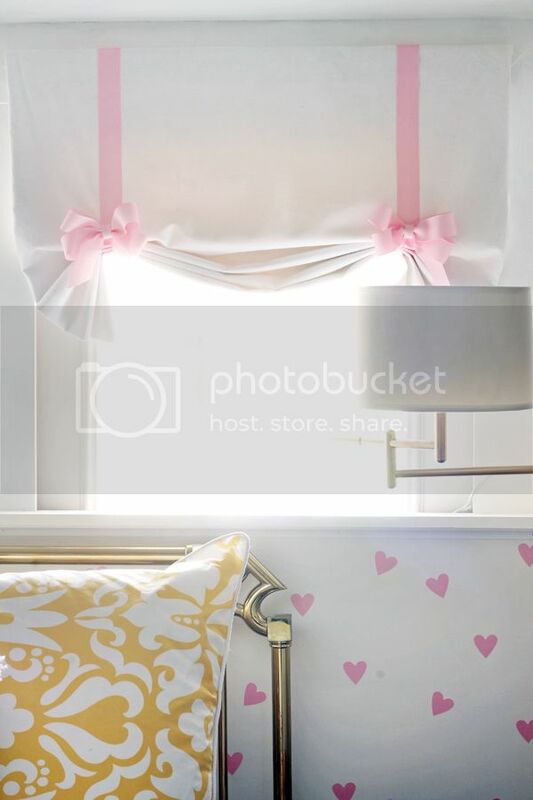 As you all know, Chloe requested Pink & Glitter as her color palette… Not wanting to walk into a Barbie room myself everyday, I broke up the pink with a lot of white, a touch of blue & the perfect compliment was her gorgeous yellow bedding. Crane & Canopy was gracious enough to send Chloe one of their latest designs from their Bright Collection. 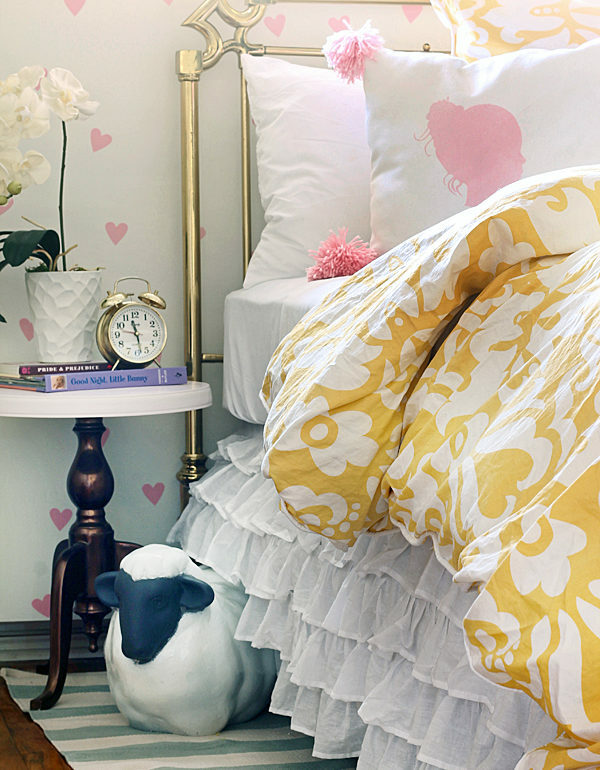 The Montgomery Yellow was just what this sweet room needed. She was so excited to have a duvet cover like mommy & daddy that we had to open it & use it in her old room until her new room was ready! Breaking her into a little luxury at a young age is not a problem in my book. The ruffled bedskirt was a Joss & Main find earlier last month. But I found the exact one on Overstock for those that are interested. 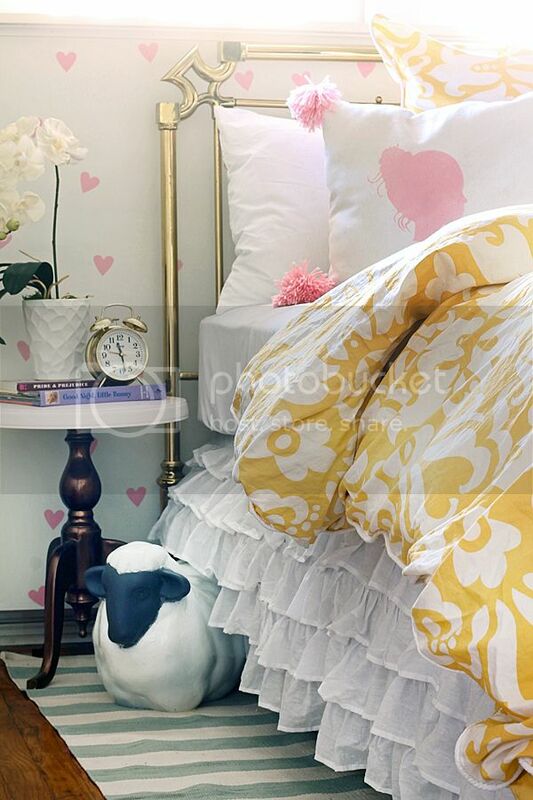 Her sheep is from Baaaa-llard Designs…. sorry, I had too. We found this sweet sheep at the Ballard Outlet we have locally. Chloe spotted it & said “can I have a sheep in my room?! ?” and when I saw it was on clearance for $17.99 I said “Absolutely!”. The nightstands were little copper tables I bought ages ago at Homegoods. They have floated around our home ever since. This one had found itself on our deck for a season & the top got a little worn. I fixed that with a little primer & her Fancy Pink paint. We have two, and I was planning on using them both as her nightstands as they were one more thing that just seemed to fit. But Santa brought her a very special present this past Christmas that also seemed to slide right into her new space. Her baby Grand Piano (that I may have helped Santa find at Goodwill last year!) plays double duty as a nightstand and a music maker. She also uses the stool to help her get into the bed as it’s a little taller than her last one. On that note, I learned that you can buy a Low Profile Boxspring that is half the height of a typical boxspring. Which was a huge help with her vintage bed. Her bed frame was a few inches taller than a standard frame, so I can’t imagine her bed sitting 4″ taller than it is now! I made her Silhouette Pillow with some scrap fabric, paint & yarn. I used my new Silhouette Machine to cut out the stencil on vinyl, laid it on the fabric & used Martha Stewart Glitter Craft Paint. (It’s glittery… trust me!) 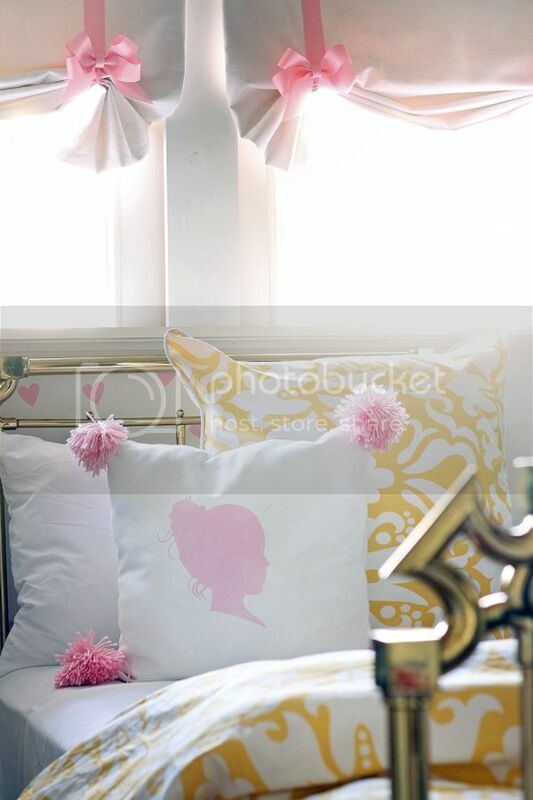 Than I made the pom poms just like on this pillow. 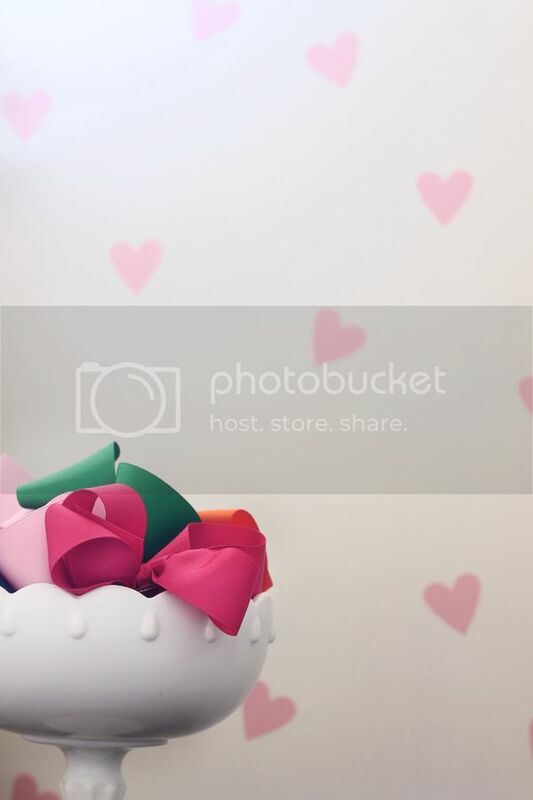 I also used the Silhouette Machine to create the pink hearts on her “wall”. I printed them out on their vinyl & Chloe & I just stuck them all over her wall. She loves stickers!!! So this was a great way to have her help with her room. I love how they aren’t “perfect” & how proud she is that she helped. Her two little window treatments were created on a whim. 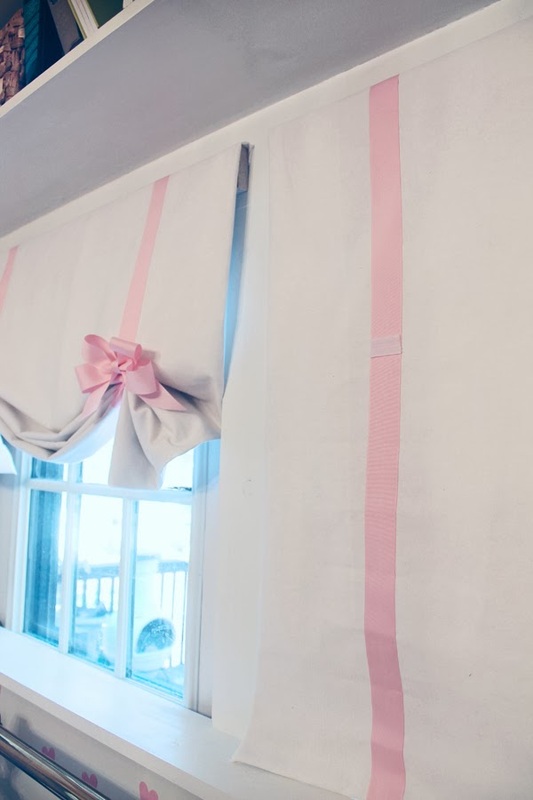 The windows were too short for a roman shade or standard blinds, so I created my own shades using some leftover white canvas, a light blocking drapery panel I got on clearance & some pink grosgrain ribbon. Basically they are just square lined panels with two strips of ribbon going down. I attached a little piece of velcro where they needed to be lifted to. When it’s time to open the shades I simply gather them quickly & attach the bow that is dangling on the backside at the exact length needed. This was an “off the seat of my pants” idea that I came up with. I am not a seamstress & do not play one on TV. I see a problem & figure out a way to fix it… sometimes it works. The swing arm lamps are from Home Decorators Collection. They came as an Oil Rubbed Bronze finish, but of course I sprayed them with some Rustoleum Gold Paint. Tomorrow we’ll talk accessories, toys & dollhouse. Thanks again for all the love this week! I love how you created this adorable space from items you had around your home – so creative and cute and fun! So frickin cute!!!!!!!! Love it all! Such a sweet room. I love all of the details! Everything is just perfect!! I am in the process of brainstorming ideas for when my 2 year old gets her own big girl bed and room and this provides so much inspiration! I love the bed, lamps, pillows, and just about everything else! I love how it turned out! With the window treatments what did you use to hang them from the window? Can't get over how sweet this room is, and that freebie bed is to die for. who gives away such goodness? #luckyyou Thanks for providing the info on the light fixtures! Great question!! I just stapled them to a 1×2 cut to the width of the treatment. We then screwed the wood into the framing we added. I know. They gave us so much we had to get a storage unit! Good stuff!! That baby grand is about the cutest thing I have ever seen. I need to accompany you to Goodwill my friend! The window treatments are GENIUS! I would love to try that! The window treatment is brilliant!! Great idea! Ahhh! I can't believe those curtains! Sooo smart! You are so talented! Her piano is so darling! I love how you created the window treatments too. 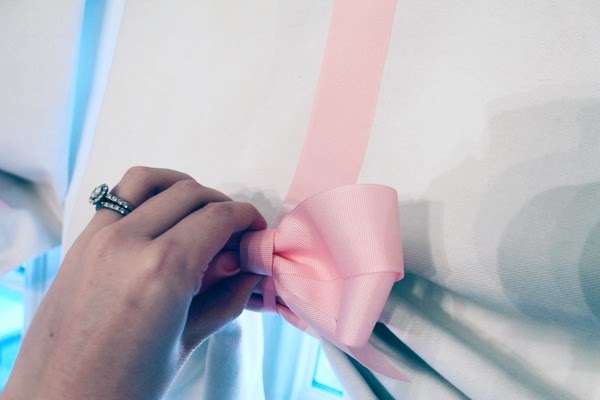 Those bows are the sweetest finishing touch! It turned out perfect! Love the details & love that marquee sign! So lovely! Love this room. Question about the dollhouse paper. How did you glue/attach the paper so it didn't wrinkle? I checked out paper-scource, so many amazing ones. I am going to be redecorating my childhood dollhouse for my daughter so this is perfect!! Thanks. Great question!! I cut it to size & took it outside & applied some spray adhesive. Or you could even use a strong double sided tape if the adhesive scares you ! I love the sheep! I wish they still had it… thanks for sharing! I love it! Like I said before, I'm kind of shocked at how similar our styles are and how many pieces in your house that I have as well. I don't have a blog and found this one from a magazine. I had to come check it out because in was ohhing and awing over your magazine article, I said to my 16 yr old- hey she stole my style! He looked and said yes but her is nicer! 😉 I have a chalk board wall, an upside down drawer pull holder, a ghost chair, gold rimmed agate coasters, a bust I painted gold, glittered deer horns, the same exact art prints, same lamps, same wallpaper and etc! Great minds? Question… did you refinish the baby grand piano? I have one that I'm dying to paint, but don't want to paint over the words, but not sure how to go about that!? Any help is appreciated! Thanks!